Lawrence University is a residential liberal arts college and conservatory of music, both devoted exclusively to undergraduate education. Lawrence is a supportive and welcoming academic community of 1,500 intellectually curious, diverse, multi-interested students from nearly every state and 50 countries—all committed to a rigorous and challenging educational experience. Led by a faculty of 173 professors* (91 percent of whom have a Ph.D. or other terminal degree), Lawrence is devoted to Engaged Learning as the most effective way to prepare students for lives of personal fulfillment and professional accomplishment. It is a demanding approach to education for students who demand much of themselves. Engaged Learning takes place in the classroom, the residence hall, the community and all our off-campus and international programs. 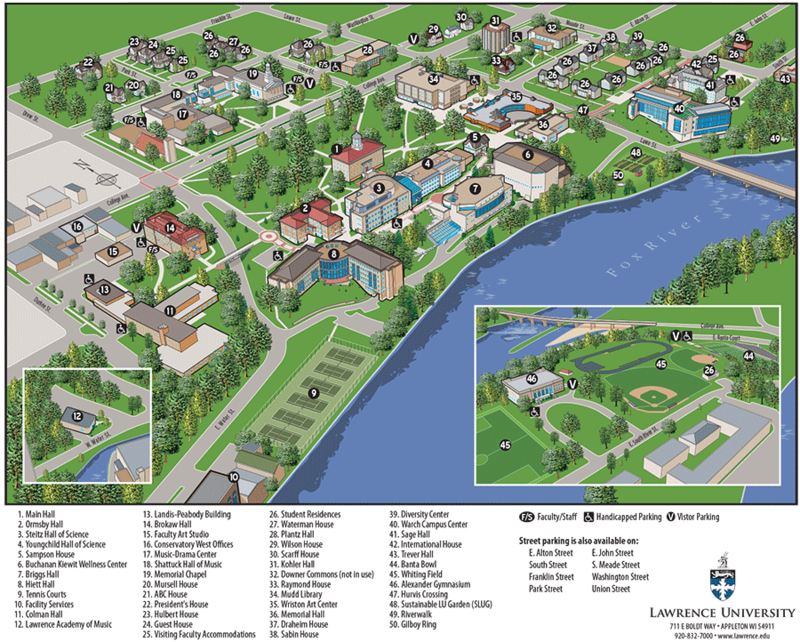 It is what characterizes a Lawrence education and distinguishes Lawrentians. Campus: 62 instructional, residential, recreational and administrative facilities; The Lawrence London Centre, located in the Bloomsbury neighborhood of London; Björklunden vid Sjön, a 441-acre estate on Lake Michigan in Door County, serves as the college’s northern campus.